Whether you're in town on business, like a lot of folk, or you're just visiting for a bachelor party golf outing, then Grand Rapids Limo is the perfect choice for you to fulfill all of your transportation wants and needs. Throughout our years in service, we have provided top-quality transportation for a seemingly endless amount of functions and events, including golf outings, school dances, and countless weddings, bachelor and bachelorette parties, and birthday parties. We've even taken groups to eh GR Public Museum, Children's Museum, Arts Museum, the Urban Institute for Contemporary Arts, the Gerald R. Ford Presidential Museum, and other great local museums. We have the very finest limos and buses in West Michigan, but providing great luxury transportation takes more than just great vehicles! So while we do have breathtakingly beautiful vehicles, we also have service that's friendly, reliable, affordable, and available 24 hours per day! Our team of friendly customer service argents is available 24 hours per day to take your calls and assist you with whatever you need. Call us when you need a quote, to book a new reservation, or if you just have questions about our vehicles or service. When you book one of our vehicles for your get together you can count on your driver to arrive on time, and you can count on your vehicle to provide you with a fun ride. Don't make the mistake of renting from an unreliable company who will show up late or with vehicles that break down. We're the company with affordable prices and luxury vehicles that won't let you down. For any and all events, we're the best choice. Birthday parties, weddings, corporate functions, school dances, sporting events, concerts, bachelor parties, bachelorette parties, and more! Our goal is to make sure our clients have a great time when they're celebrating a special event. When you need a beautiful limousine for your wedding, we have what you need. Clean, luxurious vehicles that you and your entire wedding party will love! For bar hopping, we'll act as the designated driver and take you to all of your favorite bars and clubs and if you get tired of being out, you can keep your drinking going on the bus! For sporting events, we can take you anywhere that your favorite team happens to be - here in town or all the way to Detroit. Is your favorite band in town? Get pumped up for the show by traveling to the venue in one our vehicles and taking advantage of the incredible sound systems! 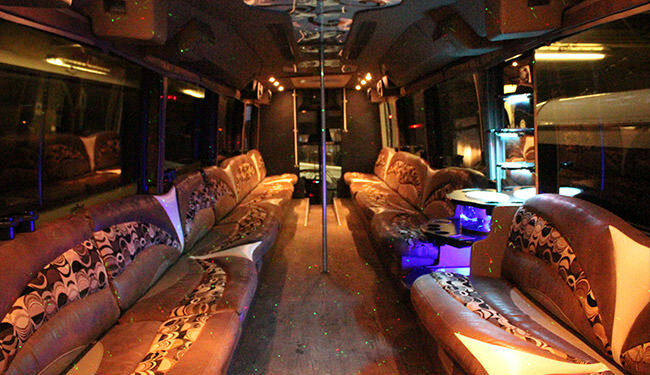 For any event, our fleet has the perfect limo or bus for you. Our vehicles are custom designed to include a wide array of features to ensure your guests have everything it needs to enjoy a night out in Beer City, USA! Comfortable seats, enough space for all your guests, colorful lights, large TVs, DVD players, CD/iPod players, and of course coolers so you can bring your favorite drinks and keep them chilled! Choose one of our vehicles from the menu to learn more! If you're interested in pricing for any one of our vehicles, just give us a call! Our 40 passenger limo bus is perfect for large groups and outings that need to transport more than 30 people. It offers plenty of space for ice, wonderful ambient lighting, leather interior, and more. Imagine you and 39 of your closest friends cruising downtown for your birthday or even after a company golf outing. It's a lot more affordable than you think. Give us a call and get a 100% risk free quote right now. The ride will be as smooth or as rockin' as you'd like because we offer a high quality sound system that even audiophiles would love to have as well as an awesome light show that will add to the mood of any celebration. 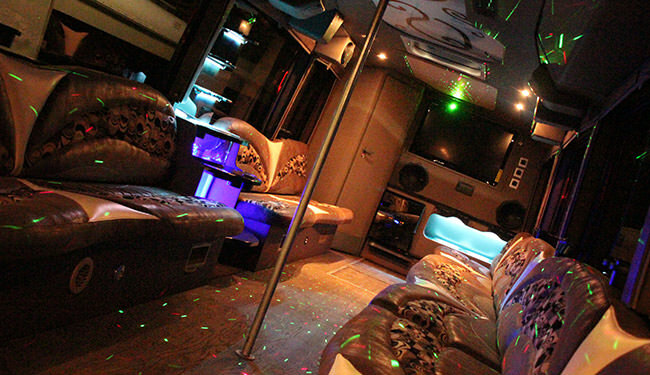 We rented a party bus to go bar hopping one weekend and we had a great time! GRL provided us with prompt, friendly service, and we had an amazing time on the bus! We'll definitely be renting again!Cali G.
I rented a limo for my wedding and couldn't have been more pleased with the service! We were picked up on time and the vehicle was clean and beautiful.Stephanie J. For my birthday I rented a limo bus to take my friends and I out and it was by far the best birthday party ever. We got to celebrate all night, even after the bars had closed. I would suggest Grand Rapids Limo to anyone.Steven P.
I rented one of their vehicles for a night out with my friends and it was a fantastic night! The bus was beautiful and clean we were able to start drinking and dancing as soon as we boarded! Our driver was accommodating and professional. Five star service!Kelly S.